With show season approaching again, it’s time to start working on bringing your horse into form—and the best way to do it is with a broad, holistic focus on its overall health and wellbeing. You can’t achieve health and beauty in your horse with last minute grooming: it’s the culmination of weeks and months of attention to its fitness and nutrition. Which is why it’s important to start early if you want your horse to look and play the part of a high performer. While it takes a good commitment to bring your horse up to the highest showing or eventing standards, it’s not too difficult with the right help and products—and a bit of inside knowledge. A healthy, glossy coat is essential for turning your farm horse into a blue ribbon beauty. Ideally you should be grooming your horse daily all year round, because it’s easier to maintain a coat in good order than it is to repair damage from the weather and parasites when you haven’t taken quite enough care. Besides that, you improve your relationship and bonding with your horse through regular grooming—and that could be the most underrated factor in maintaining good behaviour in your animal throughout the competition season. Spend a good amount of time every day with a rubber curry comb to work out loose hair and dirt, as well as bring its natural skin oils to the surface, and you’ll see an immediate improvement in dull and dusty coats. You should also pay attention to the dock of your horse’s tail, as it stimulates hair growth for a fuller, glossier tail.And while shampooing is great for treating specific skin conditions, don’t bathe your horse too much as the weather cools down, because you can chill your horse or cause fungal infections—and when you do bathe, use a scraper to take off the excess water. You should also always choose high-quality equestrian grooming products—you’ll be surprised what a difference the right shampoos and conditioners, brushes, and wash-down sponges can make to your horse’s coat. Professional hoof picks and scrapers will also do a much better job, and for the extra cost of premium products, you could be preventing more costly problems like thrush and cracking. Always remember to do your standard show trim – the muzzle, bridle path, ears, and fetlocks – no more than 72 hours before you show, or your horse will have a 5 o’clock shadow. And pay special attention to any white socks or stockings with a good clip to remove stains, a coat polish, and even wrapping before the event to keep them bright and fresh. 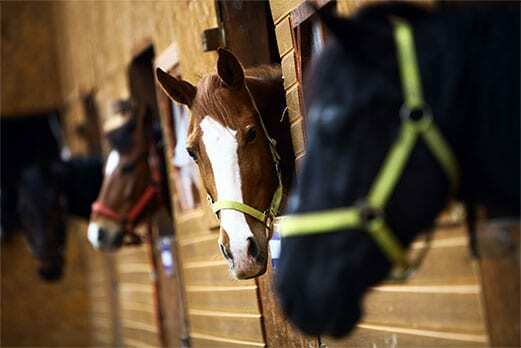 Your horse’s diet is among the most important factors in a good performance. You’ll already know that they won’t score well if they’re looking too lean, but their attitude and fitness are also dependent on you getting the balance right between their energy needs and their appearance. 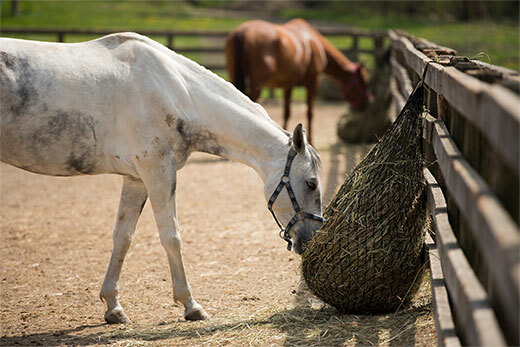 While you obviously need to monitor protein—particularly when you’re working on the topline—too much starch can cause your horse to get agitated and uncomfortable, so always keep an eye on how much your horse is getting. Besides supporting your horse to take in more calories for a good, round shape, feeding is also your opportunity to promote a glossy coat. Choose coat-enhancing grains and feed products that are packed with the right nutrients and fats, and you’ll notice an improvement in the thickness and shine of your horse’s coat, mane and tail. Some are suitable for feeding throughout the year, but always ask an expert to make sure they’re suitable for your horse’s unique dietary requirements. Monitor your horse’s dietary intake daily, and make small changes if you need to, rather than making big feed changes that could leave your horse feeling silly or lazy. So call our friendly staff anytime for advice. But a horse that has worms, illnesses or infections, or nutritional deficiencies will obviously not show well either. It’s important to keep your horse’s health as a priority all year, and not just as show time—good health depends on regular vaccines, medication and supplements as they need them throughout the year, both for the comfort of the horse, and to make it more presentable. 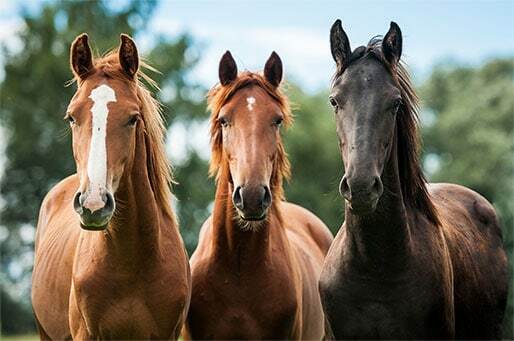 Keep your horse up to date on its worming treatments, hoof conditioners and thrush treatments, and itch and fly control all year long—and always be on the lookout for nutritional deficiencies that can be solved with a vitamin shot. As a horse owner, you obviously want your horse to remain fit & healthy throughout its lifespan, for its own quality of life & your pleasure. You can’t compensate for these issues the week before the show, and if they’re left too long they’ll affect your horse’s appearance as well as distress it. Your horse’s general health and wellbeing is a full-time commitment, and you may well be getting it all right. But if your horse is unsettled during show season with nervousness and hotness from increased calorie intake and stress, you might consider giving it special herbal blends for relaxation. But ask a professional for advice to make sure they’re right for your horse. Stabling, while not without its drawbacks, can be a good option for maintaining your horse’s health and wellbeing during competition season. It will always depend a lot on your animal—some will enjoy the security and comfort of protection from the elements as the weather cools down, and some will fight against the confinement. Horses can really suffer in Queensland’s weather, and stabling could be the single most important factor in keeping your horse happy—and its coat glossy—for showing. It offers good protection from the flies that are still lurking in the temperate weather, and helps your horse stick to strict diet regimes when you need to ensure peak performance. With the right bedding type—which could be anything from sawdust and straw to rice hull or synthetic materials—and good quality rugs, you can also help your horse get better sleep, and reap the benefits of the improvement in its temperament during the competition season. It mimics the longer daylight hours, so it will hold off on growing its winter coat and be in finer form for showing, but you should always remember it needs protection from the weather without its thick hair. If you’re really focused on presentation, you could consider leaving lights on a timer to increase your horse’s light exposure. Consider working up your horse’s basic fitness level for some time before competitions. If you think it’s fitness has suffered a bit in a break, spend more time walking for a few weeks and gently integrate trotting; but if it’s only been a few weeks since its last performance, work up from hacking, to trot work, to normal schooling and jumping over a period of about two weeks. Hill work and interval training is also great for your horse’s cardiovascular fitness, as well as reducing its chance of injury. Improved topline will also bring better performance and soundness in your horse. This is particularly true for young horses, who benefit a lot from the right exercise. If you’re having trouble reaching the right balance of energy for strength and endurance in cross country and show jumping, and soundness in the dressage ring, consider enlisting the help of a professional trainer for at least a few exercise tips that you can work on at home. Your horse’s health and wellbeing depends on good exercise all year round. But its activity is even more important during competition season, when you’re trying to aimprove both athleticism and appearance. For more information on improving the health and wellbeing of your horse this competition season, contact Gleam O’Dawn’s experienced staff, and we’ll be happy to help you towards a winning performance.